the Victorian era | Did I misplace my pince-nez again? Light reading on the 19th century. A cheery subject for you just before the Christmas holidays: beating your wife in Victorian England! Today’s guest post is by Melissa Black from Yesterday Enchanted. Ever wondered where the term, ‘Rule of thumb’ came from? It derived from old British legal traditions which considered a husband the ruler of his wife. Once married a husband could be held legally liable for his wife’s conduct in early modern times and as such, it was a widely held belief a husband could strike his wife for ‘lawful correction’ or to ‘order and to rule her’. A famous judge Sir William Blackstone’s wrote an influential book in the eighteenth-century called Commentaries on the Law of England and stated, ‘For as the husband is to answer for his wife’s misbehaviour, the law thought it reasonable to intrust him with this power of restraining her, by domestic chastisement, in the same moderation that a man is allowed to correct his …children’. The British education system has undergone drastic changes over the years and for the lovers of history, there is a lot of information about Victorian school days. The reign of Queen Victoria saw many transformations in the educational sector, most of which were backed by legislations enacted by parliament. Great Britain increasingly became a force to be reckoned with in a quickly industrializing world. This fueled the need for universal or mass education. However, there was a part of British society (especially the rich) who feared losing labour should kids from poor homes be given access to education. What transpired in Victorian days of schooling? It should be noted that in the 19th century, school attendance wasn’t compulsory, especially for girls from poor homes. Parents could send them to go work in farms to raise money to cover household expenses. Children from richer households often made use of a tutor. Over time, and especially in the year 1839, education system was subjected to gradual changes. A new approach to rolling out universal education was adopted. Its major aim was to review progress of each and every new establishment in the education sector. But still, parents who lived around cities viewed education as expensive and were therefore reluctant to send their children to school. Another reason why school attendance was low was that the children’s money earned by working in factories and on farms was needed to support the family. This building was the Union Straw Works, the biggest straw hat factory in the US. My attention was caught by the little rack-like items in the back of the building. WHAT ARE THEY? My first thought, as a Dutch citizen, was: ahh, there are their bike racks. Obviously though, they are not bike racks. How about places to hitch up your horse? But the map was drawn in 1879 and most of the factory workers would live local, they wouldn’t come by horse. So that makes no sense either. As a child, I loved maps. Having a big imagination, I would just be transported to the time and place of the map, strolling around the streets, seeing the little old man on the town square, smelling the fresh bread from the bakery, or stopping to admire a beautiful garden. To this day, I’m still fascinated by maps. That’s why I’m happy to announce that https://tedsvintagemaps.com is our monthly sponsor! I would like to show you my favorite maps. New York, a classic! I have a historical New York map on my wall at home as well. This map is from 1865, which was actually a time of great tur moil for New York. New York was formed by consolidating 5 boroughs, a process that wasn’t finished until 1898, so in 1865 it wasn’t the city yet that we know today. In 1863 New York had experienced the draft riots or Draft Week, where people had been rioting in protest of the draft for the ongoing American Civil War. These riots lasted from July 13th until July 16th. A great change to the city came with the designing of Central Park. Already in 1820 a need was felt to allow residents some open space, some air and a break from the chaotic city life. Without adequate parks, people had been drawn to cemeteries. The final designs were made by Frederick Law Olmsted and Calvert Vaux, and work on the park started in 1853. If you look closely at this map, you can make out the spot where the park is emerging. The History Of The Bed: From Horse Hair To Now. How Have They Changed? In the relatively short time since our hairy ancestors descended from the trees, our sleeping habits have gone from curling up in caves to slumbering on king-size memory foam mattresses. Now we all know that a mattress is considered up for retirement after seven years or so. (We did all know that, right?!) Well, the world’s oldest-known mattress has a few more years on that – 77,000 years, in fact. Discovered in a cave in South Africa, the mattress – which consisted of rushes and reeds – even came with with a topsheet of greenery to help our ancient ancestors fend off biting bugs and mosquitos. Pretty smart, those cavemen. It has been mentioned on this site before about how fascinating 19th century fashion is with its huge hoop skirts, tight corsets and pointed bodices. But what’s just as interesting is that in Namibia, these fashion still survive in the Herero tribe, who are known for their Victorian-style costume. How Did These Fashions Get to Africa? Although these outfits are often beautiful, the reasons they are being worn in Africa stem from the horrors of Europe’s involvement in Africa in the 1800s. Although the slave trade in Africa had ended by 1870, by that point the continent was split between Belgium, Britain, France, Germany, Italy, Portugal and Spain. After these countries destroyed traditional trade routes to build railways, many Africans had no choice but to make a living working for these Europeans in their mines and plantations. With this colonization, European fashions began to enter Africa. This, combined with European missionaries entering the country meant that 19th century fashion began to appear on the continent. African Traditions Meet European fashions This was swiftly followed by African weavers and clothes makers making their own more traditional spins on these outfits. 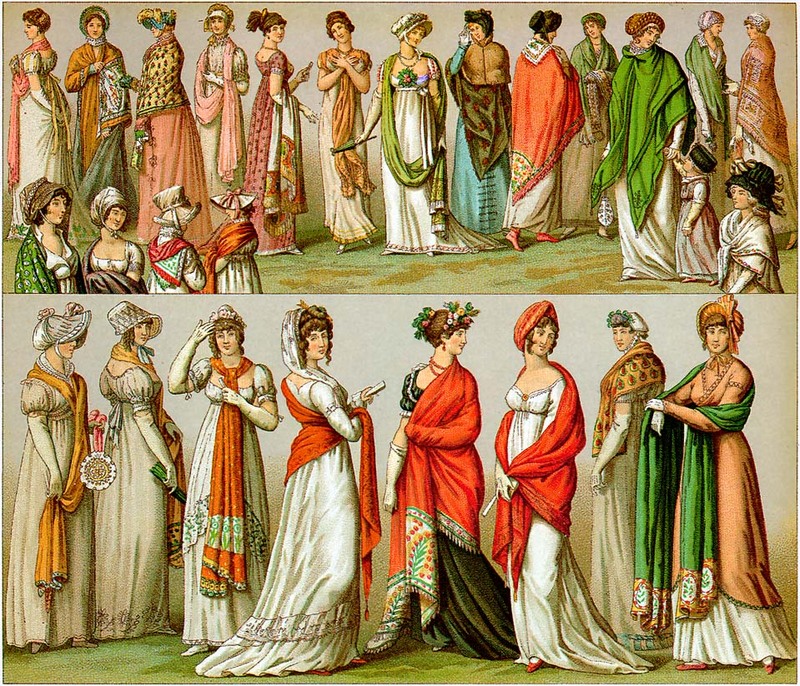 Shawls were an established part of 19th century fashion, providing extra modesty for women. European version would often start in one colour before going into a pattern at the bottom, with florals and paisley designs particularly popular. Egyptians weavers recreated these shawls in more traditional African designs. At first, they made what is called an aba, a male gown that is one of Africa’s most beautiful traditional fashions. Then they became more like the European modesty shawls for women. It is these garments that are part of the signature look of the Hereros. Though there have been some changes to it in the last 200 years, like it now being made out of rayon and other artificial fibers rather than cotton and silk, it is still essentially the same garment as worn by German missionaries’ wives, landing in Africa in the mid-to-late 19th century. Combine that with these Namibian women’s’ love of layers petticoats and full skirts and you have a tribe who have reclaimed a traumatic time by making their colonizer’s fashions their own. A question of women education arose in order to a particular social status of a woman who performed only “female” functions (wife, mother, mistress), ceased to satisfy public needs. In the ancient world, maiden received home tutoring. Only girls from the upper classes deserved to study at the elementary schools which were given by institutions under the bless of Church. Humanists (Erasmus of Rotterdam, J.A.Komensky) substantiated a necessity for female enlightenment in their writings. Practical work was conducted in monasteries, where women learned good manners, graceful needlework, music, singing, poetry, and were brought up in the spirit of piety and obedience to her husband. Especially successful was an activity of Ursulines (16th century) in Germany, France, the Netherlands, Italy. J.Pascal was a nun who worked at the monastery seminary of Port-Royal in the 17th century. She was an author of didactic issues upon the women’s education. M.Ward from England founded several Catholic institutions, where girls from families of English and French nobility were trained. English educators paid special attention to the role of a female education system.